Every month, Roger Conrad and I host an exclusive Live Chat with Energy & Income Advisor subscribers. Given the breadth of the publication’s coverage universe, these informal conversations are wide-ranging, tackling whatever issues and questions are on our readers’ minds. Our February Live Chat was particularly lively and went on for four hours, as we make an effort to answer every question that’s submitted. For this week’s Energy Investing Weekly, we decided to present an excerpt of some of our readers’ most frequent questions and our responses. 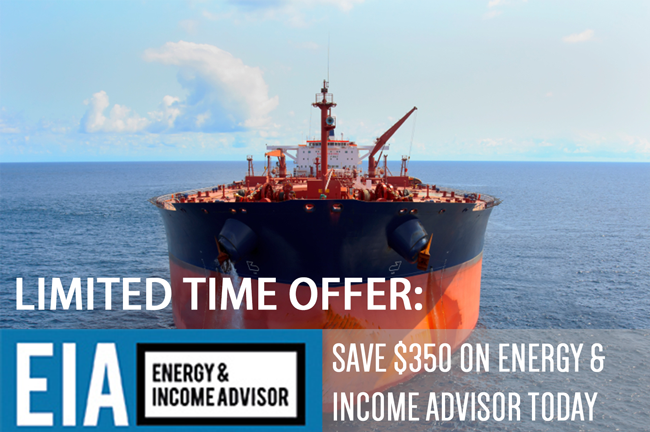 If you’re not a subscriber to Energy & Income Advisor, subscribe today to ensure that you don’t miss out on next month’s exclusive Live Chat. Subscriber: What’s your current take on SeaDrill (NYSE: SDRL) and the recent drop in day-rates for offshore contract drillers? Elliott Gue: In its fourth-quarter earnings call, SeaDrill’s management team backed up many of the same trends we discussed at some length in the Feb. 13 issue, Knowing the Drill. The problem is likely short term in nature, caused by a temporary lull in demand (really flat demand rather than growth in demand), coupled with uncontracted rigs hitting the market. SeaDrill’s dividend appears safe in the near term, thanks to ample contract coverage this year and the opportunity to monetize assets through SeaDrill Partners LLC (NYSE: SDLP) and North Atlantic Drilling (NYSE: NADL). That being said, the next couple of quarters could bring negative headlines about day-rates and the supply-demand balance for floater and jack-up rigs. This headwinds could push SeaDrill’s share price to about $30.00, at which point we’d consider adding it to one of the model Portfolios. We dropped the stock in fall 2013 because of its frothy valuation and suggested taking some profits off the table. For now, we don’t have any exposure to the offshore contract drillers in our model Portfolios. However, Patterson-UTI Energy (NSDQ: PTEN) has returned almost 30 percent since we added the stock to our Focus List and Conservative Portfolio last fall. We see additional upside as this name upgrades its fleet of onshore rigs. Subscriber: What’s your favorite idea for adding exposure to North American exports of liquefied natural gas (LNG)? Roger Conrad: First and foremost, we would steer clear of Cheniere Energy Partners LP (NYSE: CQP); this highly leveraged name has already priced in any upside potential from the completion of its Sabine Pass project. Shares of GasLog (NYSE: GLOG) and Teekay LNG Partners LP (NYSE: TGP) also appear fairly valued and lack near-term upside catalysts. Energy Transfer Equity LP (NYSE: ETE) announced plans to spin off its LNG export project as a separate master limited partnership (MLP), which would serve as yet another upside catalyst for the company that already serves as the general partner to Energy Transfer Partners LP (NYSE: ETP), Sunoco Logistics Partners LP (NYSE: SXL) and Regency Energy Partners LP (NYSE: RGP). Embattled Kinder Morgan Energy Partners LP (NYSE: KMP) also owns natural-gas pipelines that will benefit over the long term from robust LNG exports. You might also consider Oil Search (ASX: OSX, OISHY), which has a joint venture with ExxonMobil Corp (NYSE: XOM) to export LNG from Papua New Guinea to end-markets in Asia. Volumes from this project are slated to ramp up later this year, and the company’s share price has taken a hit because of weakness in the Australian dollar. Subscriber: Why does USA Compression Partners LP (NYSE: USAC) appear in the aggressive portion of your MLP Portfolio? Elliott Gue: USA Compression Partners went public in early 2013; we tend to regard many fledgling MLPs as riskier bets because of their limited operating history. Contracts in the compression market also tend to be of shorter duration than capacity-reservation deals on pipelines, so prolonged weakness in natural-gas prices or an oversupply of horsepower would present a problem on renewing contracts. These qualities mean that USA Compression Partners has more exposure to commodity prices than Enterprise Products Partners LP (NYSE: EPD) and other names that appear in our MLP Portfolio’s conservative sleeve. At the same time, the stock’s roughly 7 percent yield compensates investors for this risk. Subscriber: What’s up with Just Energy (TSX: JE, NYSE: JE)? Is the company out of the woods? Roger Conrad: Just Energy’s sharp rise can be attributed to two things: Fiscal third quarter results that exceeded management’s guidance and huge short interest in the company’s New York-listed shares. This combination produced a dramatic short squeeze–and there could be more to come if the company’s fourth-quarter results meet or exceed expectations. You can expect some profit-taking after the most recent short squeeze. I wouldn’t say that one quarter indicates that the company has emerged from the woods, but these results indicate that the firm is headed in the right direction. Until the company makes meaningful progress slashing its debt and demonstrates an ability to keep the payout ratio under 100 percent for more than one quarter, Just Energy is only suitable for aggressive investors who understand the risks and own the stock in a diversified portfolio. Subscriber: Any general comments on the price trends for Brent and West Texas Intermediate (WTI) crude oil? Elliott Gue: WTI has risen relative to Brent lately, closing the differential to between $8.00 and $10.00 per barrel. I think WTI is being driven higher by the extremely cold weather in the Midwest and East Coasts this winter. Just look at plummeting natural gas in storage and distillate inventories, and you can see what’s driving both oil and US natgas prices higher. I think the rally in both WTI and natural gas is temporary. It’s based on weather-related demand and (theoretically) spring will arrive on the East Coast again at some point (I hope). I think Brent will hang in there — either side of $110.00 per barrel and WTI will sell off to trade at a discount of $10.00 to $15.00 per barrel. Subscriber: What companies stands to benefit the most if the Obama administration approves the Keystone XL pipeline? Definitely TransCanada Corp (NYSE: TRP), though the company has more than CA$30 billion of new projects that will drive cash flow and dividend growth even if the cross-border leg of Keystone XL never comes to fruition. At least CA$20 billion of these growth projects can be completed without significant regulatory delays. Canada’s smaller oil and gas producers would also benefit from the project’s approval, though even in the best-case scenario, the pipeline wouldn’t commence commercial operations before 2016. Until then, expect further consolidation among Canada’s smaller oil and gas producers.